If one screen is being installed, the easiest is to get an entertainment center, put the tv screen on top and put the computer below. To look more streamlined, most installations use a wall mount that holds the screen and the pc. Both plug into an outlet behind the screen and the network connection is also there. Another option is to mount the screen on the wall and locate the PC in a room adjacent to the screen. Longer video and audio cables (or one HDMI cable) runs through the wall to the pc. Details on the mounting of the screen can be found here. In many business environments, it is important to show the same message to multiple screens throughout the building. A PC-2-TV.net device makes this easy using standard network cables and switches. The PC-2-TV.net set can be purchased from StrandVision Digital Signage. That has one transmitter/encoder for the PC and 1 receiver/decoder for a TV. Purchase 1 additional receiver for each additional TV you want to connect. If you do not have a 10/100 switch available, you can also purchase that from StrandVision Digital Signage. If you have more than one transmitter (pc) on this network switch, then it must be a higher end unit that has IGMP snooping or VLAN capability. The complete digital signage system using the pc-2-tv.net high definition transmitter is configured as shown below. The Cat 5 (or better) 4-pair solid network cable would be pulled from a rack in a central computer room to each screen location. If any screen location is beyond 100 meters in length, an additional network switch (dedicated to extending this cable only - and can be any cheap 4 port switch) to extend another 100 meters. There needs to be one cable added from that same central rack to the location where the computer will be running for the screen network and another cable that will be connected to the normal internet connection rack. If additional ceiling or wall speakers are needed, either the engineering / IT staff or an outside contractor will need to address that. Most installations do not require additional speaker installations since the television screens have sound. 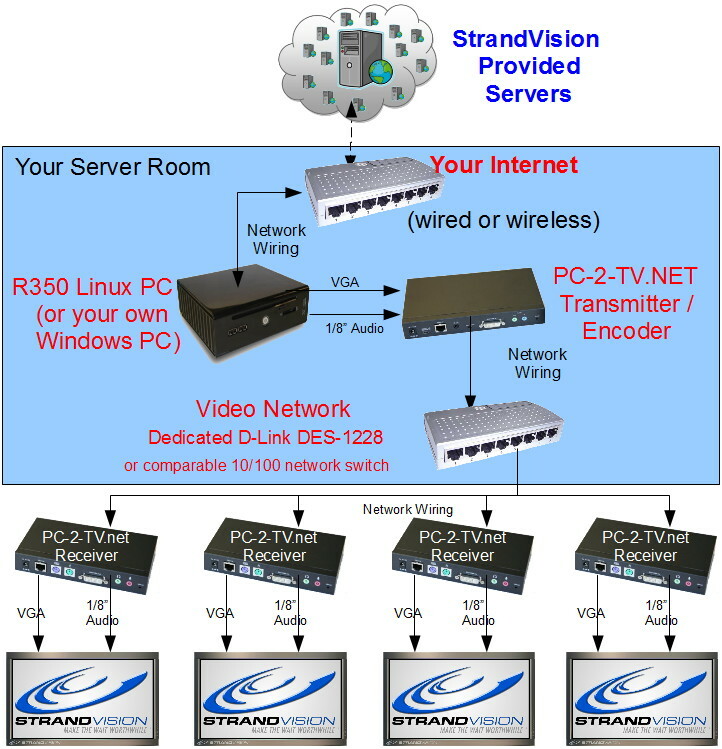 StrandVision makes it cost effective to purchase the software, the prebuilt linux pc, the video transmitter and receiver hardware and cables. We recommend that you work through your normal channels to purchase the screen, wall mount and any additional speakers and amplifiers. The screen must be able to connect to a computer using 15 pin vga input. When using the linux player with one screen, the screen only needs an hdmi input. If you have a 2Ghz dual core Windows XP, Vista or 7 PC with 512 meg of ram and a video card with 64 meg, you can use that. You can also use a normal computer screen too. StrandVision needs at least 1 week lead time for the hardware that we are providing. The subcription is activated immediately upon your completed order. We recommend that you get the software subscription started at least 1 to 2 weeks in advance so that content can be added beforehand and any necessary training can be completed. That way when the hardware is ready, everything is running in a few minutes instead of a few days.